Written by Will on September 30, 2012 and posted in Uncategorized. The other nite I was thinking about what I could build in Minecraft that would be cool. I’d played hours and hours of Tekkit but I fancied going back to simpler times and installed Vanilla Minecraft on the Gaming Now Minecraft Server. I was playing Resident Evil 6 just a little while after going Vanilla in Minecraft and couldn’t help thinking that I wanted to get back to classic Resi gameplay too. It made me think “What other classic games I could put spin on?” and the idea of building platformer Mario games in 3D with Minecraft came to me. I found the Super Mario Mod on the Minecraft forums when I looked for “Mario in Minecraft”, installed it into the minecraft jar file along with some dependencies, Vanilla didn’t stay that way for long lol. 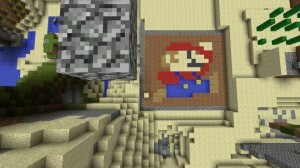 My Mario in Minecraft was born. I had all the blocks I needed to start building as well as in-game armour that color matched Mario as well as the hat being able to break blocks with my head. It was all sorted I just had to build the level and play it so that’s what I done. Here’s the Mario in Minecraft video I made and tonight I’ll be improving the backdrop, adding Goombas where they should go and recording it from the original platformer angle so check back tomorrow for the completed videos but for now you can see what NES mario would have looked like if it were in 3D with a rear view camera. Enjoy the vid and please like, comment and subscribe – it helps me keep motivated to build the complete Mario game as a Mario in Minecraft series. Please like and comment on the video, it’s a big motivator to keep building and upload more videos. Thanks!